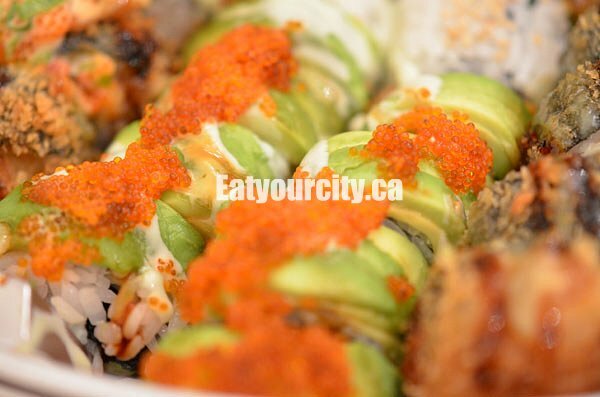 Eat Your City: El's Japanese Fusion, Calgary AB - best sashimi topped sushi rolls in Calgary! El's Japanese Fusion, Calgary AB - best sashimi topped sushi rolls in Calgary! For a recent family potluck, I swung by El's Japanese Fusion for a large order of all my favorite rolls I've tried over time. Everyone gets to try (and I get to indulge!). Service was quick inside this Korean family run joint with their own delicious take on the humble maki roll. With a small sashimi selection and over 50 rolls to choose from, its clear the star is the rolls. Having tried the (medicore) salmon sashimi in the past, I'm here for the rolls! Ordered 9 different rolls to get a good selection for the party. 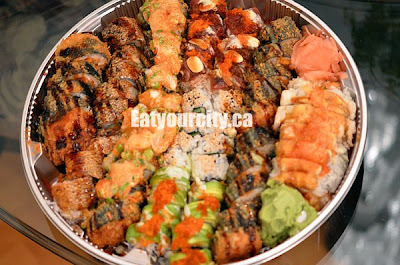 They were all placed on a large party platter of sushi happiness...I may have forgotten which is which! LOL! Crisp breaded deep fried spider roll with succulent deep fried softshell crab and topped with a super yummy amount of spicy chop scallops all drizzled with spicy house sauce YOM! Breaded deep fried prawn tempura, tobiko, squash tempura,crab, avocado, and cucumber with house sauce. 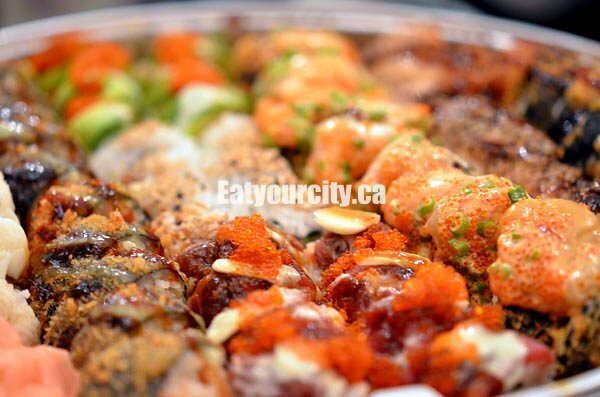 Large chunks of crab meat, crunchy crisp prawn tempura, sweet-mushy squash tempura, with tender assorted vegetables and a 7oz over cooked lobster tail on top, drizzled with mild tangy house sauce. Should have plated out the maki rolls so they look nicer. My favorites are still the Yuke, Superstar and Dynamite rolls. I ordered mainly off the special selections menu, though if you order the rolls from the regular menu, you could get a lot more rolls with less damage to your wallet! 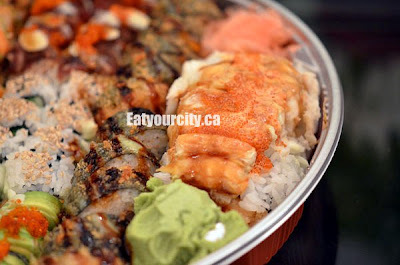 Still one of the most affordable and tastiest roll place in Calgary. The various maki rolls were happily devoured, the happy drinks were drunk and there was lots of food, laughter and fun!